How to create alternating rows in a table? 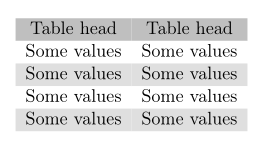 Sometimes you can see in books tables, that have alternating background color for rows in a table to support readability. How I can achieve this with LaTeX? And yes, I could put macros \odd and \even into each row, but in that case I would have to change all following rows, if I input later another row into the table. I want TeX to decide itself, which row is odd or even and put the appropiate style into it. You can use the features of the colortbl package with additions of xcolor. See code below for a small example. The particular package manuals have the details. One thing that might be worth pointing out, is that apparently, many packages call on xcolor, and I had endless clashes first time I tried it, and it took me such a long time to figure this one out, so I felt it might help someone as slow as me to mention this: The xcolor package should be loaded last (or at least after the clashing packages). Not the answer you're looking for? Browse other questions tagged tables color backgrounds or ask your own question. How to color alternate rows in latex? how do I have alternating background colors for a table? How do I color table columns? How to apply alternate row coloring in a longtable in LyX? How to change row height within xtable environment? How to create groups of table rows with alternating colors? How to make a perfect colour filled threeparttable table? Alternating row colours in tabulary? Does something like \rowcolors exist for groups of rows?